It’s not that it’s abnormal for a 2-year-old to throw herself on the ground in the middle of the mall and refuse to stand up, even after offers of chocolate and a new pony, thus necessitating the carrying-her-out-kicking-and-screaming move. But, really, none of us wants to be that mom, right? Trust us: Shopping with your toddler and maintaining your sanity is possible. Elizabeth Lyons, bestselling parenting author and mom of five, has been there, done that, and as she says, “Shopping with a toddler is the same every single time — a real adventure!” Not to worry, though, as it is possible to both shop with your toddler and leave the store happy. At least most of the time. 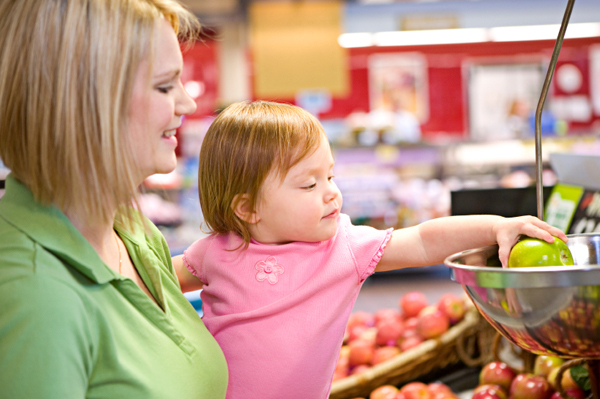 Lyons recommends planning your outing according to your child’s nap and eating schedule so that you’re not trying to grocery shop with an exhausted or hungry toddler. At the same time, she cautions moms to be flexible: Be prepared to run out a little earlier or later than planned. We’re not suggesting you reward good behavior with food, or even keep your child entertained the entire time with edible distractions, but a hungry toddler is a cranky toddler. Be sure to bring your toddler’s favorite snack. And hey, if you’re really desperate, we won’t judge you for using a treat. (Lyons herself says that she never fed her kids French fries… except on shopping trips to the mall.) Desperate times call for desperate measures. Don’t even think about leaving the house without something for your little one to do. Lyons recommends bringing a stash of stickers and (toddler-safe) toys from a dollar store to keep things new and interesting. “There are ‘experts’ who say this is bribery,” says Lyons, “but we’re talking about toddlers. Sometimes, you do what you have to do!” Exactly. >> Download some free stuff in our Kids’ Activity Center! Technically, this won’t help you shop with a toddler, but keep it in the back of your mind if you’re having an “off” day and you have the option of postponing the trip. Sometimes, it’s wise to wait until your spouse or partner is home so you can run your errand solo, assuming you’re not down to your last drop of milk. Have no expectations except the unexpected. You shouldn’t expect anything from your child or yourself, cautions Lyons. At the same time, be prepared for anything and just roll with it. Don’t hope for perfection — there’s no reason to set yourself up for disappointment — and keep your sense of humor. When all else fails, laugh. Maybe you’ve prepped for the trip and done everything right, but everything is going wrong. And people are looking. “Don’t worry about what anyone else appears to be thinking!” Lyons exclaims. Do what you have to do and keep shopping. As she says, those who are judging you either don’t have kids or have forgotten the early years. Tell yourself what an awesome mom you are, focus on your child, and keep moving!